Following a huge success of Gixxer, Suzuki Motorcycles India is launching a new variant of Gixxer calling it Suzuki Gixxer SF. 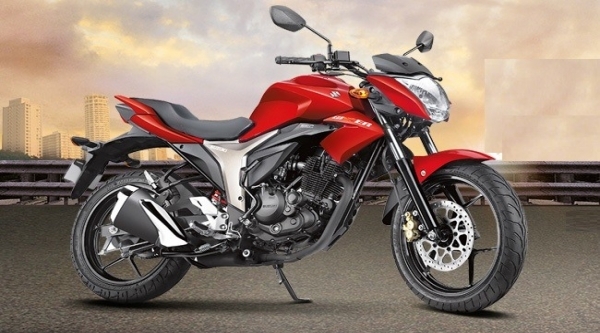 According to reports a fully faired version of Gixxer might hit the stands on 7th of April. The new bike is going to retain similar engine capacity of 155cc, which is air-cooled and yields upto 14.8PS just as in the first original version of Suzuki Gixxer. The much enhanced and revised aerodynamics found in new Gixxer SF increases the top speed of the bike. There are also rumours that Suzuki Gixxer SF could be possibly equipped with telescopic front forks and monoshocks at the rear just like its predecessors. The price of Suzuki Gixxer SF is expected to be in the range of Rs. 93,000. There is no confirmed or official word regarding the price of Suzuki Gixxer SF. The detailed specifications of Suzuki Gixxer SF is also not known yet. The launch event which is on April 7th shall bring the missing details about the next version of well-performing bike from Suzuki. When we compare similar bikes in this price range, without doubt semi-faired Yamaha Frazer, Bajaj Pulsar 200 and Hero Karizma R are going to give a head on competition for Suzuki Gixxer SF.